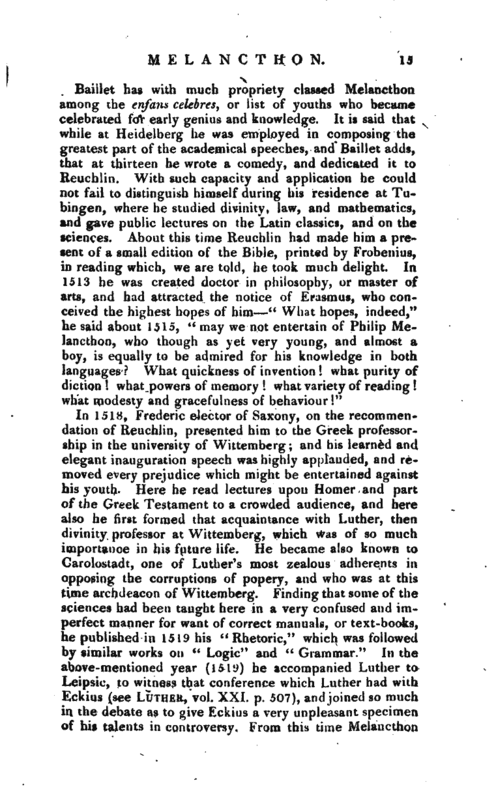 In 1518, Frederic elector of Saxony, on the recommendation of Reuchiin, presented him to the Greek professorship in the university of Wittemberg; and his learned and elegant inauguration speech was highly applauded, and removed every prejudice which might be entertained against his youth. Here he read lectures upon Homer and part of the Greek Testament to a crowded audience, and here also he first formed that acquaintance with Luther, then divinity professor at Wittemberg, which was of so much importance in his future life. He became also known to Caroiostadt, one of Luther’s most zealous adherents in opposing the corruptions of popery, and who was at this time archdeacon of Wittemberg. Finding that, some of the sciences had been taught here in a very confused and imperfect manner for want of correct manuals, or text-books, he published in 1519 his “Rhetoric,” which was followed by similar works on “Logic” and “Grammar.” In the above-mentioned year (1519) he accompanied Luther to Leipsic, to witness that conference which Luther had with Eckius (see Luther, vol. XXL p. 507), andjoined so much in the debate as to give Eckius a very unpleasant specimen of his talents in controversy. From this time Melancthon | became an avowed supporter of the doctrines of the reformation. In 1520, Meiancthon read lectures on St. Paul’s epistle to the Romans, which were so much approved by. Luther, that he caused them to be printed for the good of the church, and introduced them by a preface. In the following year, hearing that the divines of Paris had condemned the works and doctrine of Luiher by a formal decree, Meiancthon opposed them with great zeal and force of argument, and affirmed Luther’s doctrine to be sound and orthodox. In 1527 he was appointed by the elector of Saxony, to visit all the churches within his dominions. 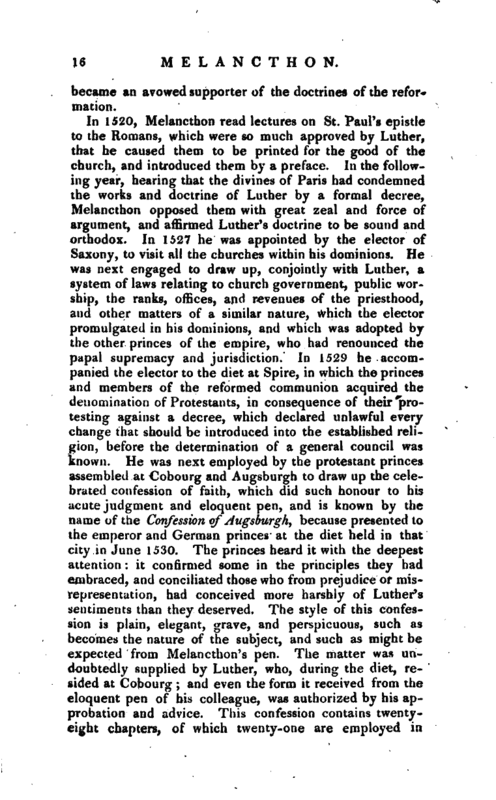 He was next engaged to draw up, conjointly with Luther, a system of laws relating to church government, public worship, the ranks, offices, and revenues of the priesthood, and other matters of a similar nature, which the elector promulgated in his dominions, and which was adopted by the other princes of the empire, who had renounced the papal supremacy and jurisdiction. In 1529 he accompanied the elector to the diet at Spire, in which the princes and members of the reformed communion acquired the denomination of Protestants, in consequence of their protesting against a decree, which declared unlawful every change that should be introduced into the established religion, before the determination of a general council was known. He was next employed by the protestant princes assembled at Cobourg and Augsburgh to draw up the celebrated confession of faith, which did such honour to his acute judgment and eloquent pen, and is known by the name of the Confession of Augsburgh, because presented to the emperor and German princes at the diet held in that city in June 1530. The princes heard it with the deepest attention: it confirmed some in the principles they had embraced, and conciliated those who from prejudice or misrepresentation, had conceived more harshly of Luther’s sentiments than they deserved. 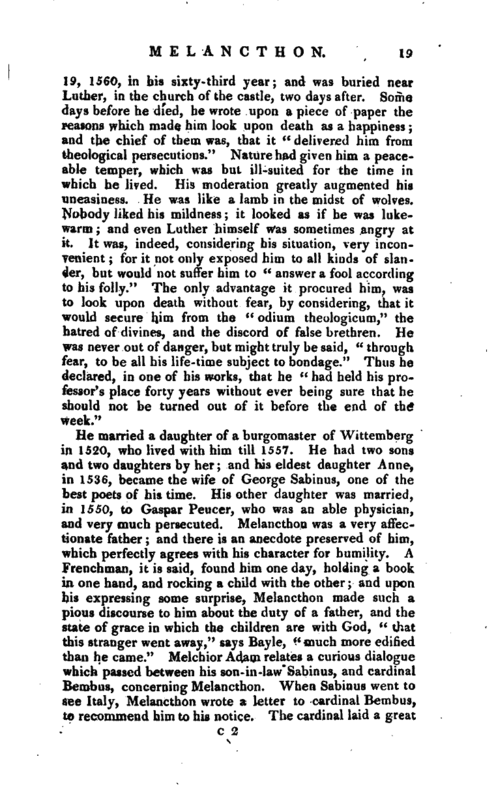 The style of this confession is plain, elegant, grave, and perspicuous, such as becomes the nature of the subject, and such as might be expected from Melancthon’s pen. The matter was undoubtedly supplied by Luther, who, during the diet, resided at Cobourg; and even the form it received from the eloquent pen of his colleague, was authorized by his approbation and advice. This confession contains twentyeight chapters) of which twenty-one are employed in | representing the religions opinions of the protestants, and the other seven in pointing out the corruptions of the church of Rome. To the adherents of that church it could not therefore be acceptable, and John Faber, afterwards bishop of Vienne in Dauphine“, with Eckius and Cochlaeus, were selected to draw up a refutation, to which Melancthon replied. In the following year he enlarged his reply, and published it with the other pieces that related to the doctrine and discipline of the Lutheran church, under the title of” A Defence of the Confession of Augsburgh." Melancthon made a very distinguished figure in the many conferences which followed this diet. 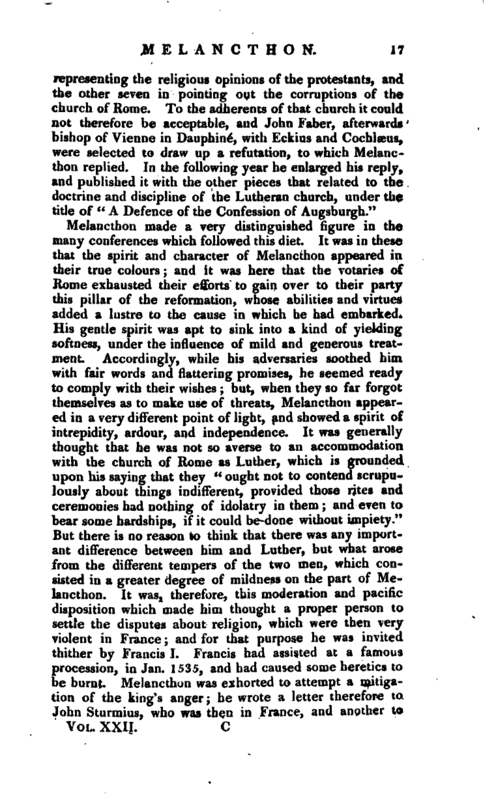 It was in these that the spirit and character of Melancthon appeared in their true colours; and it was here that the votaries of Rome exhausted their efforts to gain over to their party this pillar of the reformation, whose abilities and virtues added a lustre to the cause in which he had embarked. His gentle spirit was apt to sink into a kind of yielding softness, under the influence of mild and generous treatment. Accordingly, while his adversaries soothed him with fair words and flattering promises, he seemed ready 1 to comply with their wishes; but, when they so far forgot themselves as to make use of threats, Melancthon appeared in a very different point of light, and showed a spirit of intrepidity, ardour, and independence. It was generally thought that he was not so averse to an accommodation with the church of Rome as Luther, which is grounded upon his saying that they “ought not to contend scrupulously about things indifferent, provided those rites and ceremonies had nothing of idolatry in them; and even to bear some hardships, if it could be done without impiety.” But there is no reason to think that there was any important difference between him and Luther, but what arose from the different tempers of the two men, which consisted in a greater degree of mildness on the part of Melancthon. It was, therefore, this moderation and pacific disposition which made him thought a proper person to settle the disputes about religion, which were then very violent in France; and for that purpose he was invited thither by Francis I. Francis had assisted at a famous procession, in Jan. 1535, and had caused some heretics to be burnt. Melancthon was exhorted to attempt a mitigation of the king’s anger; he wrote a letter therefore to John Sturmius, who was then in France, and another to | Du Bellai, bishop of Paris. A gentleman, whom Francis had sent into Germany, spoke to Melancthon of the journey to France; and assured him, that the king would write to him about it himself, and would furnish him with all the means of conducting him necessary for his safety. To this Melancthon consented, and the gentleman upon his return was immediately dispatched to him with a letter. 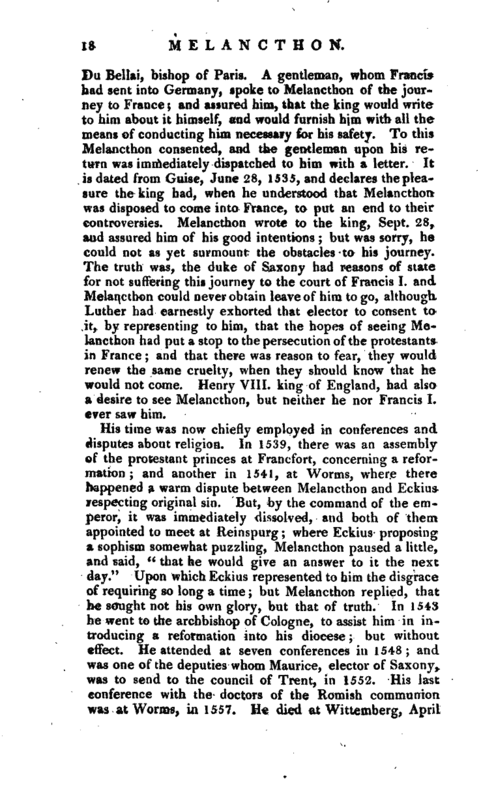 It is dated from Guise, June 28, 1535, and declares the pleasure the king had, when he understood that Melancthon was disposed to conie into France, to put an end to their controversies. Melancthon wrote to the king, Sept. 28, and assured him of his good intentions; but was sorry, he could not as yet surmount the obstacles to his journey. The truth was, the duke of Saxony had reasons of state for not suffering this journey to the court of Francis I. and Melancthon could never obtain leave of him to go, although Luther had earnestly exhorted that elector to consent to it, by representing to him, that the hopes of seeing Melancthon had put a stop to the persecution of the protestants in France; and that there was reason to fear, they would renew the same cruelty, when they should know that he would not come. Henry VIII. king of England, had also a desire to see Melancthon, but neither he nor Francis I. ever saw him. 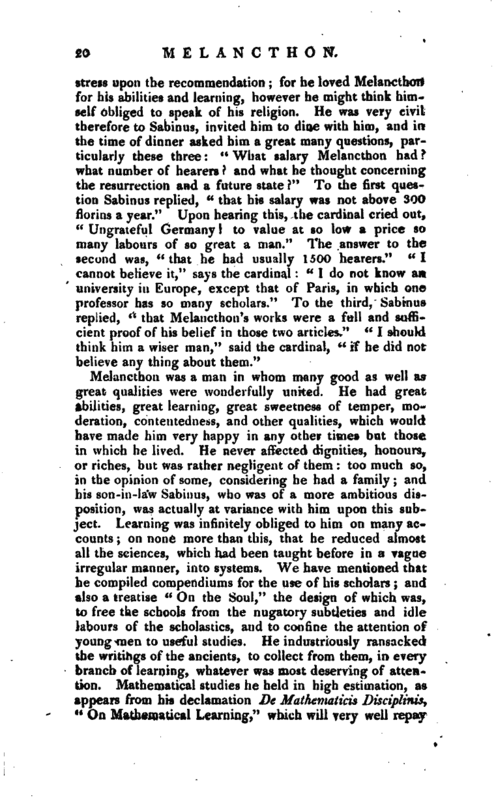 Melancthon was a man in whom many good as well as great qualities were wonderfully united. He had great abilities, great learning, great sweetness of temper, moderation, contentedness, and other qualities, which would have made him very happy in any other times but those in which he lived. He never affected dignities, honours, or riches, but was rather negligent of them too much so, in the opinion of some, considering he had a family and his son-in-law Sabinus, who was of a more ambitious disposition, was actually at variance with him upon this subject. Learning was infinitely obliged to him on many accounts; on none more than this, that he reduced almost all the sciences, which had been taught before in a vague irregular manner, into systems. We have mentioned that he compiled compendiums for the use of his scholars; and also a treatise “On the Soul, 11 the design of which was, to free the schools from the nugatory subtleties and idle labours of the scholastics, and to confine the attention of young men to useful studies. He industriously ransacked the writings of the ancients, to collect from them, in every branch of learning, whatever was most deserving of attention. Mathematical studies he held in high estimation, as appears from his declamation De Mathematicis Disciplinis,” On Mathematical Learning,“which will very well repay | the trouble of perusal. 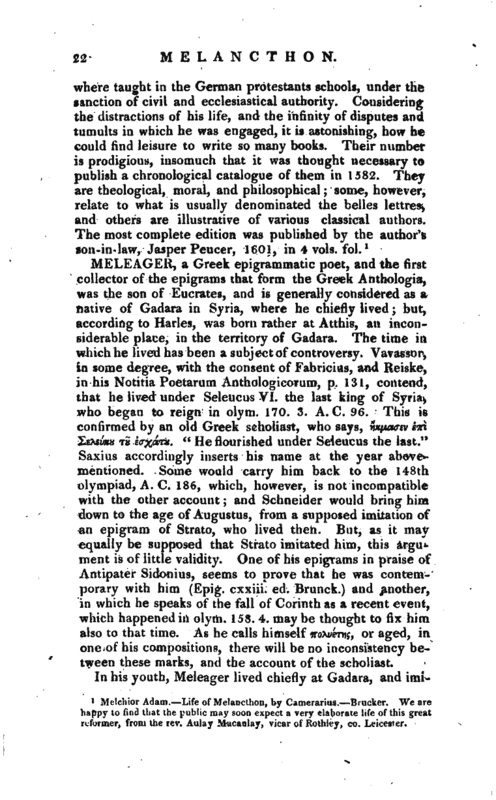 In philosophy he followed Aristotle as, in his judgment, the most scientific and methodical guide, but always in due subordination to Revelation, and only so far as was likely to answer some valuable purpose.” I would have no one,“says he,” trifle in philosophising, lest he should at length even lose sight of common sense; rather let him be careful both in the study of physics and morals, to select the best things from the best sources." 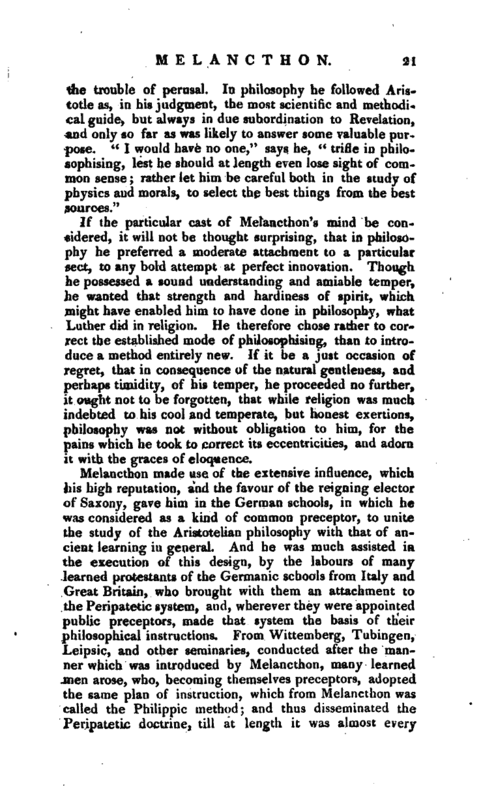 If the particular cast of Melancthon’s mind be considered, it will not be thought surprising, that in philosophy he preferred a moderate attachment to a particular sect, to any bold attempt at perfect innovation. Though he possessed a sound understanding and amiable temper, he wanted that strength and hardiness of spirit, which might have enabled him to have done in philosophy, what Luther did in religion. He therefore chose rather to correct the established mode of philosophising, than to introduce a method entirely new. If it be a just occasion of regret, that in consequence of the natural gentleness, and perhaps timidity, of his temper, he proceeded no further, it ought not to be forgotten, that while religion was much indebted to his cool and temperate, but honest exertions, philosophy was not without obligation to him, for the pains which he took to correct its eccentricities, and adorn it with the graces of eloquence. Melchior Adatn. 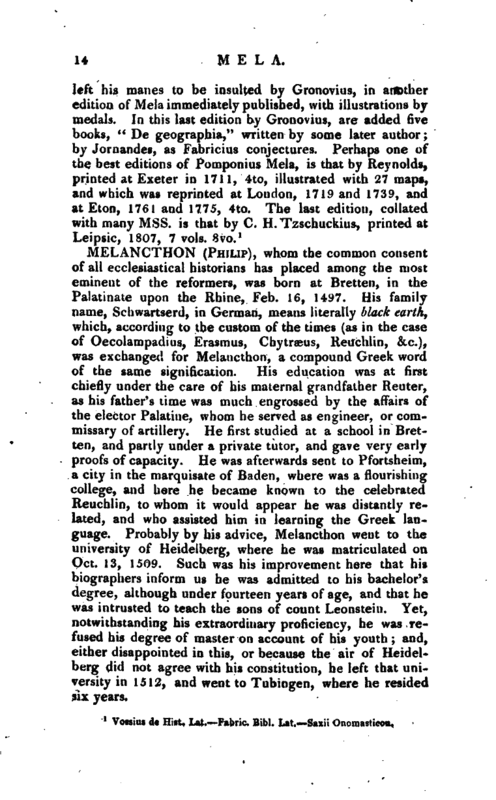 Life of Melancthon, by Camerarius. Brucker. We are happy to find that the public may soon expect a very elaborate life of this great reformer, from the rev. Aulay Macaulay, vicar of Rothley, co. Leicester.